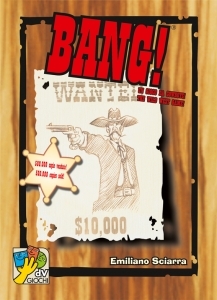 The card game BANG! 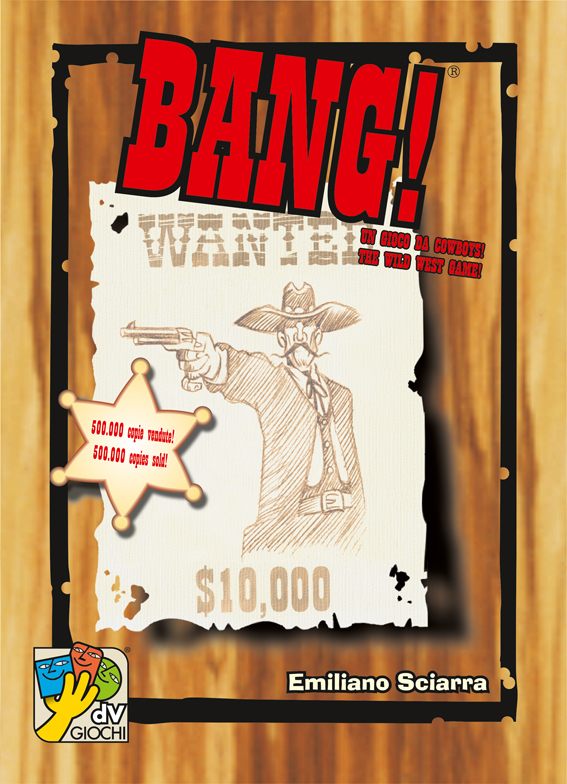 recreates an old-fashioned spaghetti western shoot-out, with each player randomly receiving a Character card to determine special abilities, and a secret Role card to determine their goal. 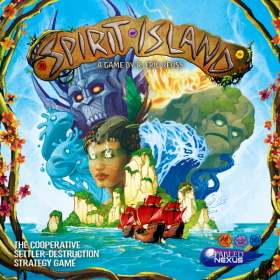 A player's Role is kept secret, except for the Sheriff. Character cards are placed face up on table, and also track strength (hand limit) in addition to special ability. There are 22 different types of cards in the draw deck. Most common are the BANG! cards, which let you shoot at another player, assuming the target is within "range" of your current gun. The target player can play a "MISSED!" card to dodge the shot. Other cards can provide temporary boosts while in play (for example, different guns to improve your firing range) and special one-time effects to help you or hinder your opponents (such as Beer to restore health, or Barrels to hide behind during a shootout). A horse is useful for keeping your distance from unruly neighbors, while the Winchester can hit a target at range 5. The Gatling is a deadly exception where range doesn't matter: it can only be used once, but targets all other players at the table! Information on the cards is displayed using language-independent symbols, and 7 summary/reference cards are included. 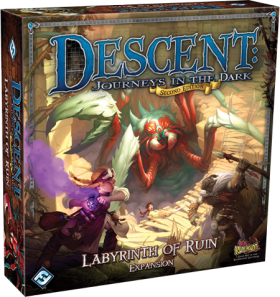 Set in a previously unexplored region of Terrinoth, Descent: Journeys in the Dark (second edition) - Labyrinth of Ruin takes players on a riveting journey to the broken remains of a forgotten city. Throughout the many quests included in this expansion, heroes will enlist the aid of unique allies in their mission to stop the evil overlord. The comprehensive campaign in Labyrinth of Ruin features nineteen narratively rich quests. As with the base game's campaign, Labyrinth of Ruin uses a clever plot system that reacts to players' successes and failures. With each successfully completed quest, either the heroes or the overlord will grow in power...leading up to a gripping showdown in the campaign's finale! You find yourself in a dystopian cityscape with a few workers at your disposal to make your mark on the world. 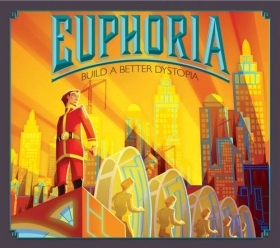 Like most people in dystopian fiction, your workers are oblivious to their situation. This world is all they've ever known, and you may use them at your whim.